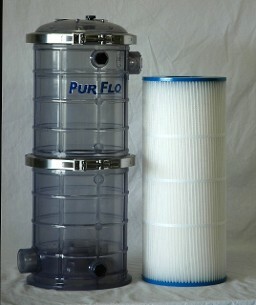 Keep your filter working flawlessly with a basket strainer from PurFlo Filtration. These are easy to maintain, and work well with our other systems. Ensure the health of your aquatic life with a high-quality treatment system. Our filter cartridges help your unit function effectively and efficiently. A clean pool with clear water makes a lovely addition to any home. Make sure the water in yours stays pure by purchasing carbon filters for your treatment system. contact our offices in Round Lake Beach, Illinois. Save yourself time and money on maintenance with a pool, aquarium, or pond filter from PurFlo Filtration in Round Lake Beach, Illinois. With more than 10 years of experience, our experts offer you the highest quality products at the lowest quality prices. You'll love the professional look and innovative design of our units, because they incorporate a basket strainer, filter cartridge, carbon filters. They were also created with the aesthetic of your pool or pond in mind, so you can be confidant that any installation will add visual appeal. Our filters are engineered based on a modular concept, and consist of stackable, cylindrical PVS sections which are clamped together with stainless steel rings. You can choose an assembly that is one, two, or three modules high, capable of up to 80 psi pressure. Each cylindrical section is 12'' tall with a 9'' diameter, and is available in either clear or gray materials. Clear is a popular choice, because it allows you to watch the system as it is functioning. However, gray is recommended for installations in areas where sunlight may contribute to the growth of algae or mold.